Today, the Supreme Court of Canada is hearing an appeal by Nevsun Resources Limited (TSX: NSU/NYSE MKT: NSU) of lower court rulings that accusations against it regarding the use of forced labour at its Bisha mine in Eritrea should be heard in British Columbia, not Eritrea. MiningWatch Canada is not directly involved in the lawsuit itself, but we are intervening in the Supreme Court appeal because we are deeply concerned that the victims of abuse in connection with Canadian mining operations internationally should be able to seek justice in Canada. 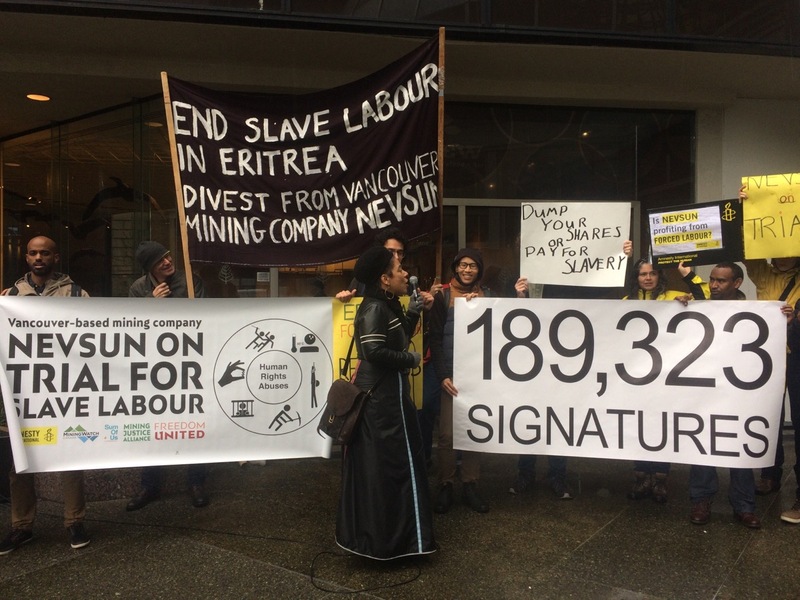 The Court of Appeal for British Columbia upheld the ruling by the Supreme Court of British Columbia rejecting efforts by Vancouver-based Nevsun to dismiss a lawsuit brought by three Eritrean men who allege they were forced to work at the company’s Bisha mine in that country. Nevsun was granted leave to appeal that judgment to the Supreme Court of Canada. In addition to the plaintiffs in the case, a number of groups will be intervening along with MiningWatch: Amnesty International Canada, together with the International Commission of Jurists; the Mining Association of Canada; EarthRights International and the Global Justice Clinic at New York University School of Law; and the International Human Rights Program at the University of Toronto Faculty of Law. The factums for the appeal are available on the Supreme Court’s case information page. The plaintiffs, who are Eritrean refugees, allege that as military conscripts, they were forced to work for an Eritrean military contractor at Nevsun’s Bisha gold-copper mine, in violation of international laws against forced labour, slavery, and torture, and that Nevsun was complicit in their treatment. The allegations have not been tested in court. So far, Canadian courts have rejected Nevsun’s arguments that the case should be heard in Eritrea, not in B.C. where it is based. In November 2017, the B.C. Court of Appeal upheld the lower court’s ruling that there was a real risk of corruption and unfairness in the Eritrean legal system, while acknowledging the considerable practical difficulties of hearing the claims in British Columbia. Nevsun is not appealing the forum non conveniens elements of the lower court judgments (i.e. whether the most “convenient” forum for the case is Canada or Eritrea), but rather focuses on two other arguments that it believes make it inappropriate for Canadian courts to hear the case. The company claims that since customary international law – in this case outlawing slavery and torture – has not been adopted in Canadian legislation, it cannot be enforced by Canadian courts. Nevsun also claims that since the Eritrean government is accused of carrying out the actual alleged abuses, the “act of state” doctrine in the common law, which protects the sovereign rights of governments over their internal affairs (in this case, Eritrea’s treatment of its own citizens), means that this should be a diplomatic case, not a legal one. MiningWatch Canada will be arguing against this interpretation of the act of state doctrine. We think that though this case does implicate foreign state conduct, it is a private civil dispute and does not engage the Canadian government’s conduct of foreign affairs. We also argue that this view acknowledges the need to provide access to justice, and complements Canadian policies for promoting corporate accountability. In addition, if the act of state doctrine is applied, it must be in a manner that accounts for the difficulties that foreign victims may face in bringing civil claims. We look forward to a good hearing and a positive judgment.